Pull out the AC plug. Put back the AC plug while holding down the "Menu" button and keep holding it (15 sec): you're entering the Maintenance mode and "error 46" pops up in the display. Select 8 by using the arrow buttons, push "OK" and select "0" and push "OK"
Message 00:00 00:01 OK appears. Switch off the printer, switch it on. Press buttons OK, Menu, Mono Start one by one, followed by up arrow key four times. this should all be done as short a time as possible, around 3 seconds. Use the up'down key and OK button to enter the reset code 2, 7, 8 and 3 keys to reset the counter. Press Stop/Exit key to go to root of maintenance mode. Absolutely fantastic. Many thanks to who ever posted this fix. 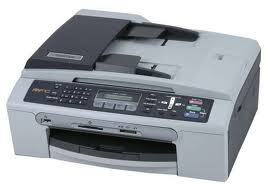 I love my brother printer and although I have and epson, the brother is much neater. To the one who posted anonymous . . no need to see purge 00000 . .
if it does not power off . . . just unplug the ac power and put it back. . . presto it works. Excellent - thank you to whoever posted this fix. I have a Brother DCP-115C and got the message Unable to Clean as opposed to Unable to clean error 46 but thought I'd give the fix a go anyway and it worked a treat. Amazing stuff, thanks. The first solution didnt work but the second one did. Thank you so much for this great advice. It worked like a magic! This post was way more helpful than the printer's user's guide :). Took your solution 1 for my Brother Printer and it worked a treat. Thanks for the help. Have a MFC440CN and had to tweak the steps. This printer allows you to enter the whole number before hitting OK. Enter '80' then hit OK. Enter 2738. No need to hit OK. Also. use the down arrow to scroll to the PURGE setting. And Bob's your uncle. Couldn't get PURGE to reset to all zeros. This worked with some modification, I had to leave out pressing OK after the numbers - just entered the purge digits as one long number. Thanks for posting. it works. Worked on my MFC A3 printer with a bit of variation. But why does it happen at all if its only a fake error and not a real error? it started working again. Fabulous. Thank you to all who put up these info for free!! What is your model printer ? Thank you for this post. It works!!! For Brother mcf490cw "unable to clean 46"
1. Press Ok, press Menu, press Mono, press Up arrow(4 times) wait for the word maintenance will display. Power off the printer and unplug the power cable. Fab-u-lous!! Worked a treat - thank you so much for this guidance. Wonderful instructions. Worked first time. • Pull out the AC plug. • Put back the AC plug while holding down the "Menu" button and keep holding it (15 sec): you're entering the Maintenance mode and "error 46" pops up in the display. • Message 00:00 00:01 OK appears. • Select 2783 and push ok (Using keypad of printer... ever). • Switch off the printer, switch it on. Thank you very much. God bless you. Thanks a lot.It's a great help for me. thank u so much . its a great help for me again thanks. Only snag I had was I needed to enter the code and press OK once at the end not after each number as it appears in the instructions I guess some editions vary. You have saved me rushing to buy a new printer, thanks again! RG.